The maple leaf is the characteristic leaf of the maple tree, and is the most widely recognized national symbol of Canada. Aaahhh, the taste of maple. Is there anything better or more Canadian? I always loved these melt-in-your-mouth candies made from maple syrup, but had never tried to make my own. Following this recipe from Epicurious as a guide for the candy making process, I gave it a try for the feast of Canada's St. Andre Bessette today. St. Andre was a Brother of the Congregation of the Holy Cross and as the doorkeeper at Notre Dame College in Montreal, St. Andre humbly devoted his life to prayer, serving the Lord and comforting the sick and afflicted. His responsibilities were to answer the door, to welcome guests, find the people they were visiting, wake up those in the school, and deliver mail. Brother Andre joked later, "At the end of my novitiate, my superiors showed me the door, and I stayed there for forty years." St. Andre is commemorated in most of the world by an optional memorial on January 6. His memorial is celebrated in Canada on January 7. I know it is too late for most to probably make these for today, but since tomorrow is his Canadian feast might be an option. But, next week St. Marguerite Bourgeoys optional memorial is January 12. St. Marguerite founded the Congregation of Notre-Dame de Montreal, and was also instrumental along with her teaching nuns, in helping to establish the Canadian city of Montreal. A cross since St. Andre was a brother with the Congregation of Holy Cross. The cross is also good for St. Marguerite as depictions show her wearing a large cross as part of her habit. He also had a great devotion to St. Joseph so any symbols associated with St. Joseph could work, too for St. Andre. Also a door since St. Andre was called "God's Doorkeeper." Maple leaf molds are the traditional one for these candies and since we are talking about Canadian saints that works well. Remove from the heat and let cool for 3 to 5 minutes. Do not stir or disturb the candy at this point; if the thermometer is attached to the pan, leave it there during the cooling period. Carefully spoon/pour the candy into the molds. It’s helpful to have an assistant spread the syrup in the molds while you continue to pour the mixture into the other molds. Allow the candies to cool, remove from the molds, place on a rack to dry for a few hours, and enjoy. St. Andre Bessette and St. Marguerite Bourgeoys, Pray for us. 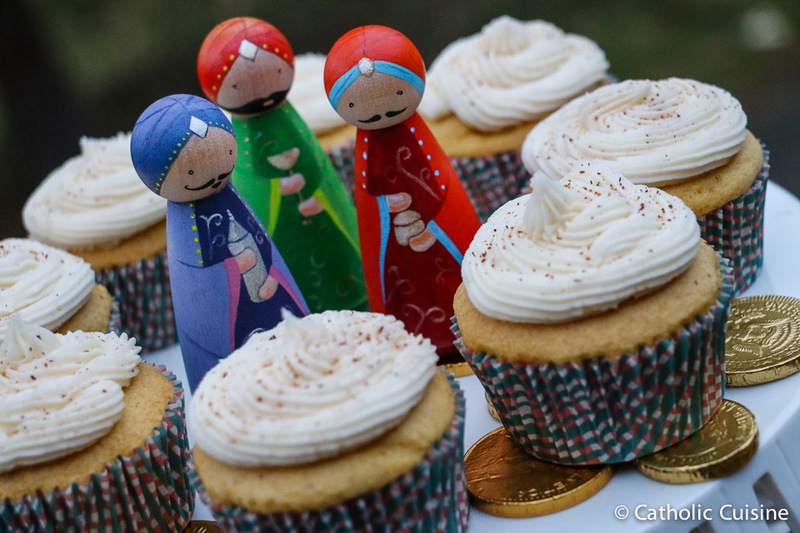 Epiphany Cupcakes from last year's celebration! The word Epiphany means “manifestation.” As such, the object of the Church on this feast is not only to commemorate the historical arrival of the Magi with their gifts for the new-born King, but moreover to adore the same Christ Who continues to reveal Himself to us today. You can find a delicious recipe for Eggnog Cupcakes with Eggnog & Rum Buttercream Frosting in the archives. Scroll through additional Epiphany recipes here. With the upcoming feast of St Elizabeth Ann Seton (January 4), it seems a good time to feature an idea for those saints associated with education. A hearty vegetable meatball soup is a good one for a winter evening and adding in alphabet pasta is a way to recognize teaching saints. We have several saints this month associated with education, who are patrons of students or teachers or who were teachers themselves, like St. Elizabeth Ann Seton, who opened schools, trained teachers and prepared textbooks for use in the schools. St. John Neumann (January 5) is credited with establishing the first system of parochial in US and opened 100 schools in eight years in Philadelphia while bishop. St. Marguerite Bourgeoys (January 12) established an order of teaching sisters in Canada and opened the first school in Montreal. St. Francis de Sales (January 24) is a patron of educators. St. Angela Merici (January 27) founded the Ursuline Order, the first religious order for women dedicated exclusively to the education of girls. St. Thomas Aquinas (January 28) is the patron of universities, Catholic schools and students. St. John Bosco (January 31) ran a school for boys and is the patron of youth. In bowl, combine mayonnaise, bread crumbs, Parmesan cheese, garlic powder and ground meat; mix well. Shape into bite-size balls and arrange on 9 x 13-inch baking dish. Bake meatballs in oven for about 20 to 25 minutes or until cooked through. Meanwhile, cook pasta according to package directions, rinse, drain and set aside. In large saucepan, heat oil and sauté onion and garlic, celery and carrots for about 5 minutes or until crisp-tender. Add broth, tomatoes, tomato paste and Italian spice; bring to boil. [I added chopped kale as an option since it is considered a "brain food" and this is a soup for educators.] Reduce heat and simmer, for 30 minutes or until vegetables are tender. Add pasta and meatballs. Reheat and serve. St. Elizabeth Ann Seton, and all patron saints of teachers, education, and students, Pray for us.